One off-season isn’t enough to return the Seahawks to the the top shelf. 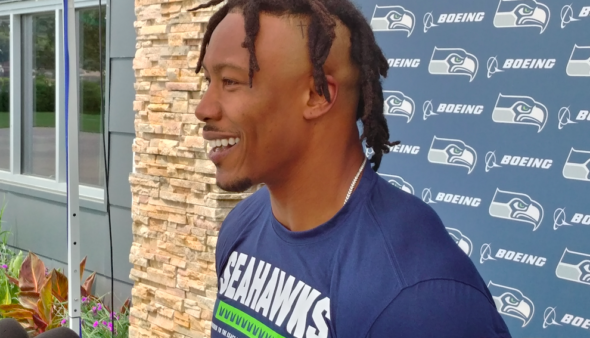 But if overlooked guys such as WR Brandon Marshall, 34, do the unexpected, Seattle could surprise. Through a tumultuous off-season and a winless preseason, the Seahawks have tried to convince themselves and us that the 2017 season left merely scratches, not the dents, smoke and steam that seem fairly apparent. The franchise still runs, but with three away games in the first four, there’s a hard road ahead for damaged goods. Then again, it’s pro football. Everything is damaged goods. If the Seahawks beat the odds and go anywhere beyond 7-9 this season, several of them are going to have to get past injuries and other shortcomings to out-play their projections. Chief among them is Marshall. It may be a stretch to say a No. 4 receiver who isn’t going to play special teams is more than a marginal contributor. But that’s the point. Some unexpected guys have to step up. In five games with the Giants last year, he had 18 catches for 154 yards and no touchdowns, with a long of 18 yards. Those numbers are why the Seahawks were able to sign him to a free agent deal with only $90,000 in guaranteed money. Other numbers — 6-foot-5 and 232 pounds — explain why the Seahawks are more than a little desperate to have him succeed. After letting walk into free agency TE Jimmy Graham, the Seahawks have Marshall as the biggest, most experienced target in the passing game. In the continuing injury absence of newcomer TE Ed Dickson (6-4, 250), and the run-blocking priorities for TEs Ed Vannett and rookie Will Dissly, the Seahawks need a big guy to go up and get the occasional desperate fling from a fleeing Wilson. There’s reassurance for Wilson that in Marshall’s 12 NFL seasons, there’s little he hasn’t seen. Coach Pete Carroll eased Marshall along throughout training camp and preseason. It appears to have paid off in time to be ready for the opener Sunday in Denver (1:25 p.m., FOX) . Marshall seems slotted behind Doug Baldwin, Tyler Lockett and newcomer Jaron Brown, and ahead of second-year man David Moore. In the four preseason games, Marshall had just three catches for 44 yards — for whatever it’s worth, the Seattle leader was RB C.J. Prosise with 10 for 51 — but his work in practice was noteworthy. “It took him a while to get in shape, so we just had to postpone the evaluation on him,” Carroll said. “His smarts, his willingness, all of that has always been there. The physical breakthrough was last week. Still, he’s long removed from the last of his six Pro Bowl appearances (2015), and the various surgeries make him vulnerable to re-injury. But in January, responding to a Twitter follower who asked about his greatest feat, Marshall wrote that it was in the future: Comeback player of the year. That last sentence also sums up the Seahawks roster that has been undeniably diminished. “We have the makeup,” Marshall said. “We have the leadership and the coaching staff and the locker room and we have the work ethic. For Seattle fans in 2018, that’s what the comparison needs to be, not with the 2013-15 Seahawks. Only a few players remain from the Super Bowl teams. And a single off-season, after several poor drafts, is not enough to replenish the talent level. Undramatic as it seems, an 8-8 year is in the offing. Unless the unheraldeds, such as Marshall, beat the odds. 8-8 if they’re lucky. Rolling out a crappy o-line and a depleted defense in a much improved division smells more like 5-11 or 6-10 to me. With parity being what it is, there is such a fine line between 10-6 and 8-8. I’m not super optimistic about the Hawks prospects, but I think it’s going to be fun watching it play out. A few more made field goals, a few more rushing touchdowns might make all the difference this year. Or not. But I’m excited to find out how it goes for them. Well, you’ve been right on so many other things, let’s go with that. If they can run it, 8-8 is doable, but rough. The NFC is just too good, however, I don’t trust the Rams. They had one of those stock the locker room with talented crazy people offseasons (not the good kind of crazy) that never seems to work out. The 49ers have a just atrocious defense, and the Cards are rolling with Sam Bradford. Also, who knows, last year the NFC ended up being wide open because it seemed like every good player got hurt. All that said, this has the feeling of all the Seniors graduated and we’re rolling with the Freshman. I agree. I don’t think the rest of the NL West is all that good. Everyone loves the Rams, everyone loves Garoppolo, etc. But that’s just a bunch of writers/pundits/talking heads repeating what all the other writers/pundits/talking heads are saying. it’s an echo chamber out there. And they’re mostly all saying the same things about the ‘hawks too. But not me! I’m saying the ‘hawks will win the division at 9-7. just because, well, because Sam Bradford. And because unloading all those talented distractions will be a net positive. and the offensive line will improve. also russell wilson, bobby wagner, earl thomas, and pete carroll. Hey, somebody besides Carroll has to be optimistic. In Seahawks parlance, it’s 2012 all over again. Art, I love the interview with Marshall. Seems like the kind of guy who can continually challenge himself. I’m hard-pressed to find 8 wins, but this team is notorious for starting badly and that’s when the winnable road games are (Denver and Chicago). They could easily be 1-5 before the bye week with a win either against the Raiders in Oakland or Dallas at home. Then, if things somehow start going extremely well (and other teams have injuries), maybe 5 wins after the bye (at Lions and home games vs 49ers, Cardinals, Vikings (it’s always possible), and Chiefs). So I’m stretching here to get to 6-10. What about you? Projecting out a season is fun, but fruitless because injuries impact football more than any other team sport. Hence, Chuck Knox’s point. People forget that by the 4Q in the New England Super Bowl, Seattle was down several defenders. Brady went 13 for 15 in the quarter, but all anyone recalls was the final play. That’s because the final play was the only one that mattered. The rest was just foreplay. I think the 49ers and Rams are going to fall far short of expectations, and if Wilson is truly a $30M/yr perennial MVP candidate then there is no way they lose more than 7 games. No upper-echelon QB (Brady, Rodgers, etc) doesn’t will their team to more than 9 wins per season, and if Russ is as good as he is supposed to be, then there is no way they finish worse than 9-7. If they do, then RW hasn’t earned the kind of money Rodgers got. I also think Jaron Brown is going to emerge as Wilson’s new 2nd-option-behind-Baldwin go-to-guy. The kind we have been missing since trading Jermaine Kearse. I do not think Lockett is anything special at WR and while I love the Marshall story and I think he can be a good red zone threat, I do not think he has the speed to separate and make many plays between the 20’s. I think a big point of all the offensive changes was to take pressure off Wilson, and here you go piling it on. To get to nine, Wilson needs to try to do less. not more. I have agreed with you the whole time about taking the pressure off of RW. I think the run game will be vastly improved, I think the WR group is the best Russ has had, and I think the O-Line will actually protect him. I’m not saying that he needs to “do more,” but I am saying that if he is the $30M franchise QB that we all hope he is, he needs to find a way to use his magic at the opportune moments, and to be the guy who makes the right plays at the right time, like a true franchise QB does. Converting 3rd downs, controlling time of possession, hitting the corner fade in the end zone… stuff like that. QBs who pass for a gajillion yards are rarely the guys who lead their team to Super Bowls. Just ask Dan Marino, Dan Fouts, pre-Terrell Davis John Elway, Philip Rivers, 2017 RW, etc. Who needs a dealer when the dealer is the State? 3-13. No reason for optimism. Maybe we can get the #2 pick in the draft after Buffalo selects first.